Windward’s STEAM Scholars program is for Upper School students with a passionate interest in extended studies in science, engineering, or other technical fields. STEAM challenges motivated students to bridge real-world applications and academic studies in order to enhance their abilities to succeed in the 21st century. 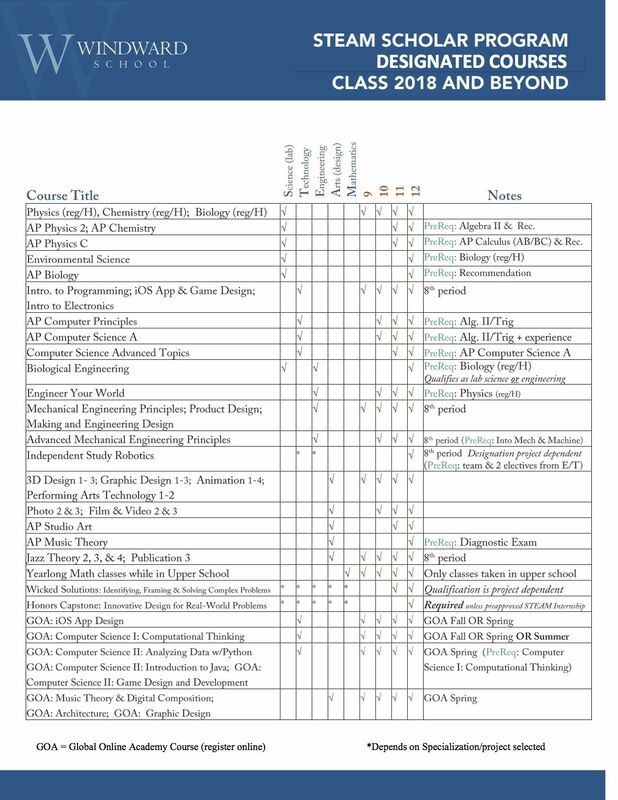 Through an approved course of study, combined with out of class experiences, Upper School students may pursue their passion for science, technology, engineering, design arts, and mathematics. Upon completion of the program, students who earn the STEAM Scholars Certificate will have demonstrated the knowledge, skills, and habits of mind to pursue further studies and careers in the STEAM fields. Develop as leaders and support one another through collaboration and team building. Internships: Summer STEAM-related internships (subject to STEAM Director approval) will count for ½ year towards the coursework requirement). All art classes, both in the visual and media arts and in the performing arts, count towards this cumulative total. Students must maintain a digital portfolio of STEAM work, acquired skills, and reflections. This portfolio will be used to demonstrate progress in core competencies and will be regularly monitored by the STEAM Director. Students must complete a significant, STEAM focused, community service project every year in the program—all must be proposed and approved prior to undertaking. *Senior Capstone proposals may be counted as service project where appropriate - approval of the STEAM Director must be obtained. Please click here to access the application form. For more information about the STEAM Scholars Program at Windward, please contact Simon Huss, Director of STEAM Programs, at shuss@windwardschool.org.